WTOP's Mark Segraves was waiting in the anteroom between Council Chairman Kwame Brown's office and the Council's main chamber, along with NPR reporter Patrick Madden and the Examiner's Alan Blinder. When the chairman left his office to enter the chamber for their continued budget debate, Segraves asked about a report from WUSA reporter Bruce Johnson that federal investigators had revealed part of their case against Brown. The chairman declined to answer any questions about the investigation during the conversation. WASHINGTON (2:33 p.m.) – The chairman of the D.C. Council shoved a WTOP reporter Tuesday in City Hall after being questioned about a federal investigation against him. WTOP’s Mark Segraves was waiting in the anteroom between Council Chairman Kwame Brown’s office and the council’s main chamber Tuesday morning, along with WAMU reporter Patrick Madden and the Washington Examiner’s Alan Blinder. When the chairman left his office to enter the chamber for the council’s continued budget debate, Segraves asked about a report from WUSA that federal investigators had revealed part of their case against Brown. Brown first walked past the reporters and answered “no questions.” Upon further questioning, he shoved his forearm into Segraves chest and pushed him up against the wall. Hear audio of the altercation at right. As he left the anteroom, Brown asked his staff to remove Segraves. Brown later “winked and smiled” to Segraves in the chamber from the council dais. Johnson had tweeted Monday night that Brown is “no longer in the dark” about the FBI investigation into campaign wrongdoing. 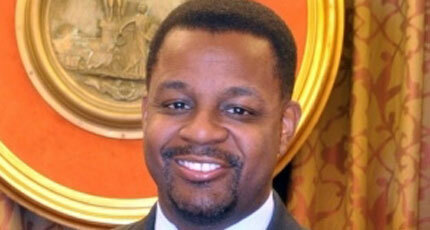 Sources say Dc Council Chmn Kwame Brown no longer in the dark. Federal prosecutors have revealed parts of their case in private meeting. As of 12:30 p.m. Tuesday, Segraves was still waiting to get comment from Brown or his staff at City Hall. This isn’t the first time Brown got into a heated encounter with reporters or WTOP staff. Earlier in January, he engaged in a “screaming match” with Mark Plotkin, who was then WTOP’s political analyst.